I hope you're having a fabulous week so far. We're so close to the weekend! Yippeee.... Superbowl weekend. I only like the Superbowl for the commercials. Well, really quick post here. The Pretty Pattern is up at My Time Made Easy and I'm feeling a little citrus-y today. 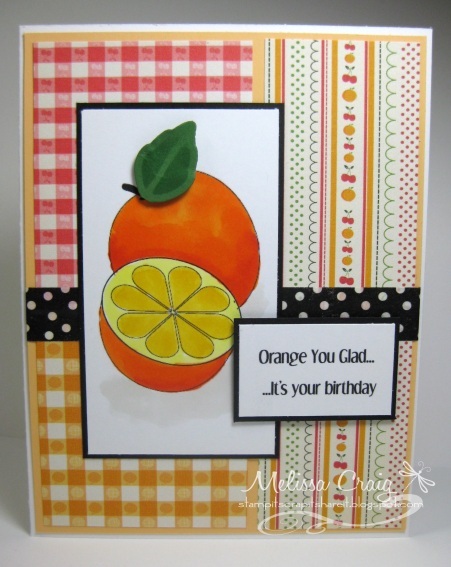 My card features images and digi papers from the Tooty Fruity collections. I love how fresh and fun my card looks! I still need to be better at coloring bigger solid images. How do I get it to look less streaky? Oh well, try try try - that's all I can do. 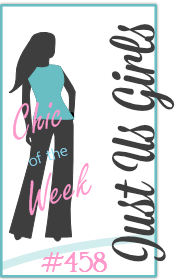 I hope you'll join us for this bi-weekly challenge. See you over at MTME. Good Morning! Happy Tuesday. I did enjoy my day off yesterday. No, I didn't get to sleep in. No, it wasn't all day long with my time to myself. But it was just nice. My new position at work requires me to think a lot more than the other position did.... it's exhausting. But in a good way. I don't look forward to my email in box when I get in, but hey.... it's a job! This week's sketch is up at TMS and it was designed by our Laura. She is also responsible for procuring our sponsor, too. Lil Inker Designs is sponsoring and all I can is WOW! Come on tax return, momma wants to shop! 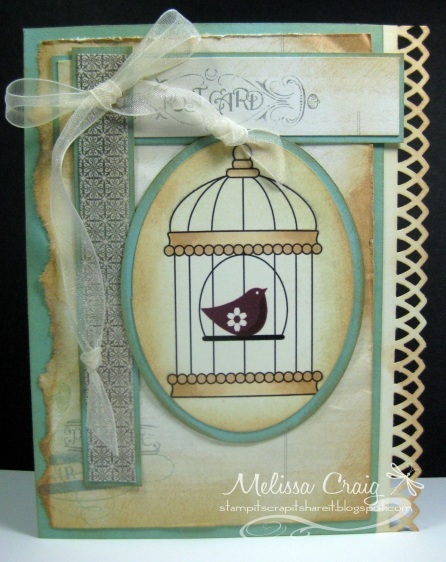 Sweet clear stamps, great dies.... ahhhh, everything my little heart can desire. Here's what I created with the sketch. Now the card didn't exactly come out as I envisioned. But I have shared that Valentine's Day is so not my thing and it sort of shows in this card. Look passed the uneven coloring and just drink in this adorable little bee. Isn't she the sweetest little thing? That face is irresistible. There is a lot of dimension in this card. Laura stamped some images for us to use, she sent three of the bee. I used them all. The base and the next layer is popped up and then I popped up the flower and the wings again. I bought my daughter some Smash tape (like washi tape, but lower quality in my opinion) that she never used for the Smash Book she created for her BFF, so I absconded it and used it here. The strip looked great, but after that, the more you unroll the sticky peels off some of the color on the next layer. Oh well, it was on sale and it doesn't look too bad as long as you don't look real close. And who would want to? My eyes are stuck on the bee. Head on over to TMS to play with us. Good Morning! Happy Monday! I hope you all had a great weekend. I did, it was very relaxing. I cleaned on Saturday which felt really good. My home is dust free... for a couple of days. It's very dusty here, I don't get that. I guess I'm so used to WV and the humidity keeping the dust down. I didn't do a lot in the craft corner - a decision I'll regret later. But for now I have a project to share with you that iced two cupcakes with one bag of frosting. (I don't like the killing two birds with one stone phrase.) I needed to create something for Fun 'n Flair and come up with a project for Scor-Pal. I am thrilled to be a Guest Designer for Scor-Pal - but I am so afraid I'm not going to come up with projects to share that won't deathly pale in comparison to Tami Mayberry and the rest of the team. I don't want to disappoint Tami or Diana. So, stamping a sweet heart border on a white panel, I created the inside of the card. I left plenty of room for a personal message. Where does Fun 'n Flair come in.. well, the sentiment on the front is from It's All About Love sentiments and the heart border is from the just releasing set, Shayla Goes Cupid. 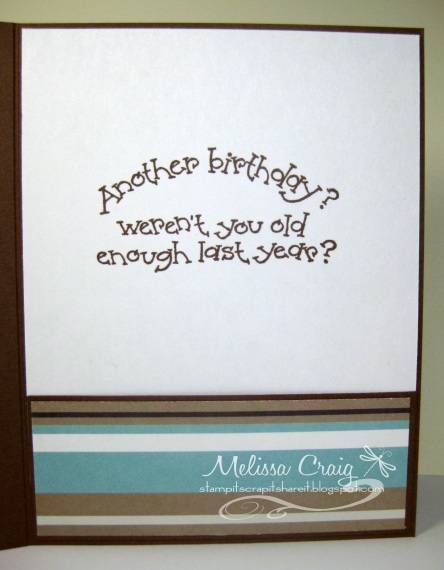 I had so much fun creating this card for both Scor-Pal and Fun 'n Flair. I hope I didn't violate any rules by combining these companies. Afterall, they truly compliment each other. I am also submitting this to All That Scraps Anything Goes challenge.... I hope I'm not too late. Hello! How are you doing? I'm doing well, too. I had a pleasant weekend, Monday went by pretty quickly and my kids came home after enjoying a nice little visit with their grandparents. I'm going to keep this post short. I'm sure you have a lot of stamping to do. Come play with us! Hi everyone! Happy Sunday afternoon to you. I am having a very enjoyable day, I hope you are, too. Actually, my blog post is to catch you up on what I've been making over the weekend. First up, this should've been posted yesterday. I'm late again. Here's the next page in the baby brag book that I've been sharing on The Pink Elephant Scrap Challenge. This week is a color combo. I love these colors! I did use the sketch from Clean & Simple Sketches, but I'm not linking because I think I'm embellished a bit more than the rules say about CAS. Next up is a card I made to send to my sister Theresa. This is also playing along with CAS-ual Friday's challenge: Long and Short. This is a 3 x 6 card with matching envelope. I made a seal for the envelope. The envelope was so easy to make with my Scor-Envy tool and Scor-Pal. I sealed the deal with Scor-Tape. And lastly, I had to make a birthday card for my friend's son. It is soooo hard for me to do masculine cards! But here's what I came up with. I used a great sketch from Seize the Birthday that also called for a masculine card. And the inside. The piece on the bottom is actually a little pocket for a gift card to be slipped inside. I realize the sentiment is much more whimsical than the front of the card. But it's the only message I could find and it's a seriously forgotten stamp. I have a shoe box filled with wood mounted stamps that have been hugely neglected. Well, I do hope you enjoy my Sunday line up. Now I'm off to get sushi! Good Morning! Happy Friday! The weekend is finally here. Any plans? I think I'm going to go to my friend Teresa's house for stamp club. I haven't stamped with other stampers in forever. I think it'll be fun. I was so excited to get to use these big red flowers that I have had for a very long time. It worked for this sweetheart tag. 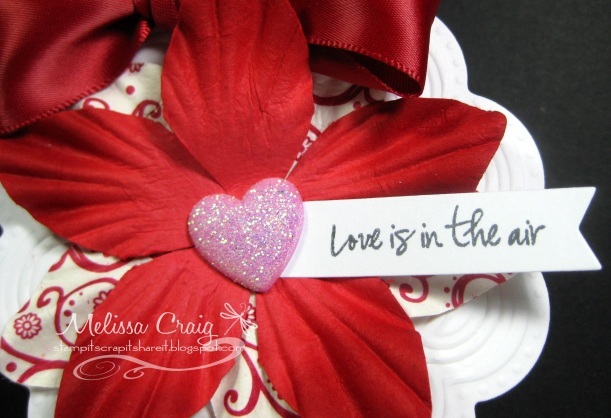 I added a glittered heart for the center. 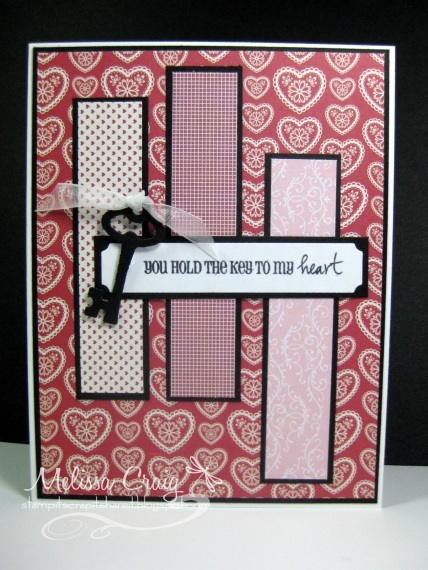 Then adding a tag with one of the sentiments from the All About Love set. I love the font that Selina used for this set. So cute! I hope you join us this week. See you there. Hi there! We're baaaackkk!!! And we have a very sweet release this month. 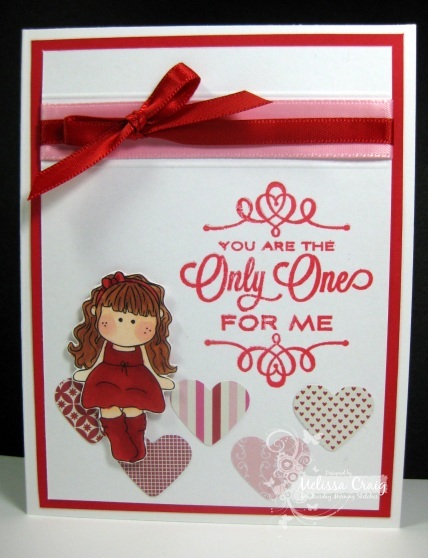 Selina has created some adorable sentiments for Valentine's Day. Now I'm going to preface this post with Valentines is so not my thing. It wasn't even our thing when my husband and I were together. So mission will be to show you how you can use these sentiments for something other than Valentine's Day. Just not today. This is really card for that auspicious occasion. I had a coupon for Michaels and they currently have a pretty cute paper pack called Love by Recollections. So I had some fun with it. I followed a great sketch from Unscripted Sketches, pulled out some new dies and old dies and made this card. I think it turned out rather cute, it would've been nicer if I had some gold metallic paper for the key, but hey, this works! 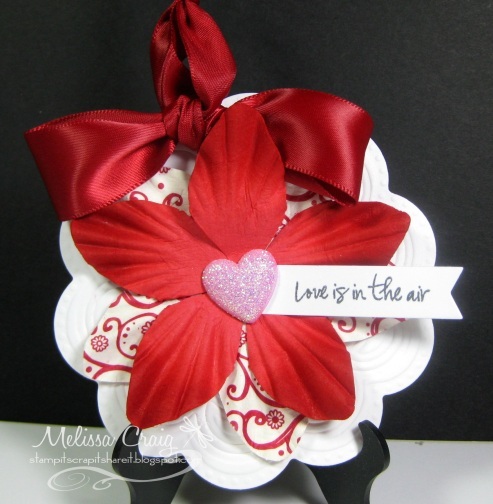 Be sure to stop by Fun 'n Flair so you can get your hands on "It's All About Love" stamp set. And be sure to come back tomorrow to join us for the next challenge. Good Morning! Happy Thursday. How's your week going? Mine is going pretty well, I'm pretty busy at work, so it makes the days go by really fast. Speaking of fast, it's already been 2 weeks since the last pretty pattern challenge at My Time Made Easy and it's time for a new one! 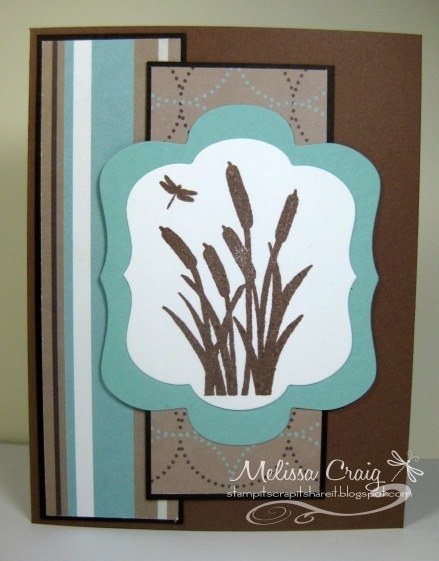 You'll have to head over to the blog to see it, but let me show you my card first. I had a lot of fun creating this sketch and then even more fun making the card. I did envision more flowers, but it started looking gawdy. So, less was more. 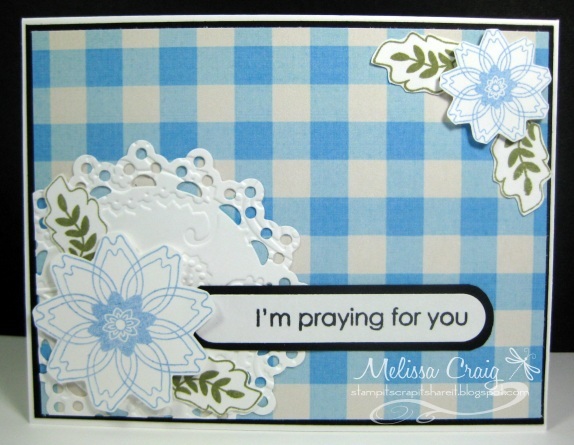 You should see this card in person, the doily is embossed. The flower sort of hid it. OK now you can leave and go visit the MTME blog to play along with us. Hello everyone! Happy Tuesday and it is a happy Tuesday because it's time for a new sketch at Tuesday Morning Sketches and you're going to love it. It can be Clean and Simple or it can be decorated over the top. The choice is yours. It's also the Judged Challenge week, so the added twist is to use two ribbons. Our sponsor this week is Stamp Fairy. I was fortunate enough to have been on the first Design Team for Stamp Fairy, so I know firsthand how charming Gerda's images are. I am featuring Molly Throughout the Year - June. I perched her up on punched out hearts and then added a sentiment that's from My Favorite Things. Please join us at Tuesday Morning Sketches. Have a great Tuesday! Hi everyone! Happy Sunday. It is a gorgeous morning here in sunny Sanford, FL. The temperature outside is wonderful, not cold and not hot. I finished all of DT assignments for the week yesterday, so I'm playing today. Actually, I need to go for a walk and then work on the baby blanket. It's coming out nicely. And yeah, I am pretty sore. So here's a card I made to play along with some challenges. First up, CAS-ual Fridays which is Round of Applause (celebrate an accomplishment and feature at least one circle) and then I went to clean&simple for a great sketch. I pulled out a stamp set that I haven't played with in a very looooong time. 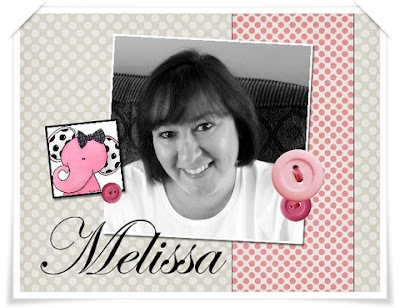 This is Pond Pals from Sweet n Sassy Stamps. The first time I stamped him, I colored him with Copics. But then when I turned it over to put on adhesive, I must've had some ink on my Scor-Mat (which my Scor-Pal & Scor-Mat NEVER comes off my table) and it dirtied my duck. So I started over and decided to do paper piecing. Well, I'm off to eat a bowl of cereal and then work on the baby blanket. I hope you have an enjoyable Sunday. Hello everyone. Happy Saturday. I am late getting this posted, I am so sorry. It's been a busy day for me. Cleaning, taking the car in for a much needed oil change and a minor repair. Working on some other things, too, I forgot to get my post set up. Today is our beloved Lori's birthday, so let's give her a shout out! Happy Birthday Lori!! My page is another installment to the baby brag book I am making. This is the ulitmate of birthdays... the day of birth. This page will actually be part of a 2 page spread, but this one I made late last night so I was a bit too tired to make the other side. I did follow a sketch from Sketches in Thyme but I'm not linking up since I don't meet their requirements. I don't have a thing stamped on here. And I took out an element because I have no pictures to add to the page. But I like how it turned out and the sketch served it's purpose - it inspired me. I hope you join us at TPE for this week's challenge. It's time to get those pictures out of boxes and onto some great layouts! Good Morning! Happy Tuesday! I am so happy that it's Tuesday because Monday is over and that's always a good thing and because I get to show you my card I created with the newest sketch at Tuesday Morning Sketches. This week we're sponsored by Freckled Fawn. A great little shop for Washi Tape and other fabulous embellishments. I love how my turned out. I just got a "new" set from my blogging friend Katie Skiff. I don't even know if it's a currently available set from My Favorite Things. But I am totally smitten with their Die-Namics dies. 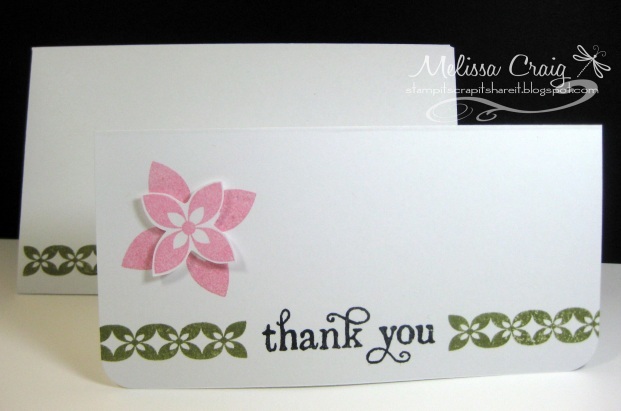 My card also features two washi tapes that were perfect for my card and my sketch. 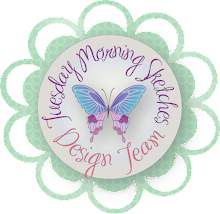 Please head on over to the Tuesday Morning Sketches blog to play along with us! Good Morning! I hope you all had a great weekend. Guess what I did? I picked up a crochet needle again. I have been wanting to make a baby blanket for (another) friend at work and I got it in my head. Then I thought, there's no way I can endure the pain, but I just couldn't bring myself to do anything else for her. So I did it. I had a great coupon for yarn. I bought a pattern book, which ultimately proved to be too difficult for me, so I found an easy, free pattern on the internet and I actually am doing it. My wrist and shoulder are sore, but I'll live. Anyway, so now that I don't have quite as many design teams on my plate, I also had time to whip up this card last night in about 15 minutes - if that. It was easy by following the challenges at Just Us Girls (sketch) and CAS-ual Fridays (thank you). Now, although you'll see make a few Valentines Cards, this is not my preference. And why I did this one, I'll never know - but hey, it's not for Valentine's Day - it's a thank you card! Have a terrific Monday and we'll see you tomorrow for Tuesday Morning Sketches. Good Morning! Happy Sunday to you - I hope you're having a great weekend. I know I am, I've been playing, relaxing and reading. I really enjoy my Kindle Fire. Here's something else I've been enjoying... playing with my Scor-Pal and products. 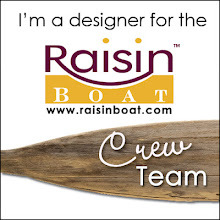 I have been lucky to land a guest design spot! I cannot tell you how thrilled I am about this. But I'm a bit intimidated, too. How am I going to come up with great projects to share with you? Well, I'll do my best. I went calendar crazy with the start of the New Year! I'm sorry that picture isn't so pretty, but wait til I show you the calendars individually. This was the first one I did. Now I found a You Tube video by Caroline Buchtine (here). Now what she created were great, but I felt it needed a bit more stability. So here's what I did. I started with a base piece of card stock that measures 7 x 9 1/2. Then on the Scor-Pal, score at 1, 4 1/2, 8 and 9 inches. Fold at your score lines, all mountain folds. The 1/2 part will be a valley fold. Then apply Scor-Tape along that edge and adhere to close up the tent. I hope that makes sense. And then decorate. I then took it further. This calendar measures 5 1/2 inch square. And then one more. 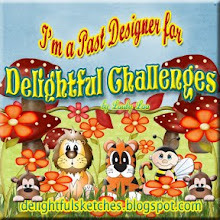 This one I followed the sketch for MFT's Guest DT challenge. This one measures 4 1/2 inch square. 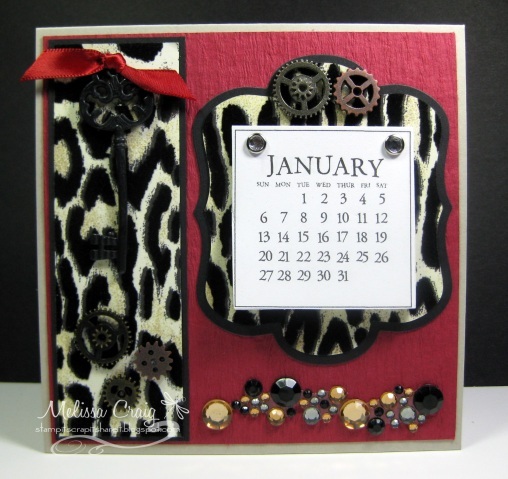 I feature MFT stamp set Clearly Sentimental about Audrey Hepburn, Die-Namics Mini Royal Roses, Die-Namics Fishtail Banners and the dies that came with the new Genius Ultimate Platform. I'm not sure I like the Genius Ultimate Platform, but I like the dies that came with it. I do hope you enjoy my calendars and try making one for yourself. Oh! The calendar pages came from Pinecone Press. Hi there! Happy Saturday afternoon. 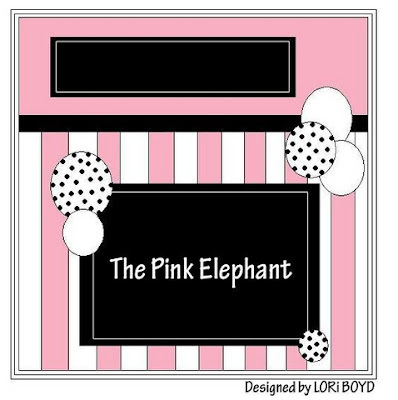 If you're here for just a visit, thanks for coming by and please, let me invite you to join The Pink Elephant scrapbook challenge team's blog hop. This is our official debut! And this is me, the picture was taken a couple of years ago, but it's my favorite one of me. I really tried to update my photo, but ugh! Anyway, a little bit about me. I am a single mother of 3 teenagers and they are wonderful children. My oldest son Brendan will graduate high school this year, my lovely daughter Hollyanne is in the 9th grade and is in her 7th year of ballet. She also takes Jazz and Lyrical. My youngest son, Levi is 13 he's a challenge, but an absolute teddy bear. I've been scrapbooking since my oldest son was about a month or so old. And then when I was pregnant with daughter that I started stamping. And I've never looked back. I also enjoy other crafts and hobbies such as reading, crochet and cooking. I don't watch TV much. And if that wasn't enough, I also own my own sketch challenge blog, Tuesday Morning Sketches. This will be a finished size of 5x5. I based this page on a sketch from TPE that I believe was published in May of 2010. 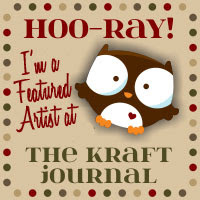 Now, you're next stop on the blog hop is Stacey's blog. Enjoy!! Good Morning! I am so happy that it's Thursday already. 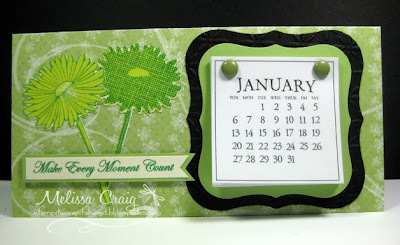 I've posted the newest Pretty Pattern on the My Time Made Easy blog and I think it's a fun one. I hope you do, too. 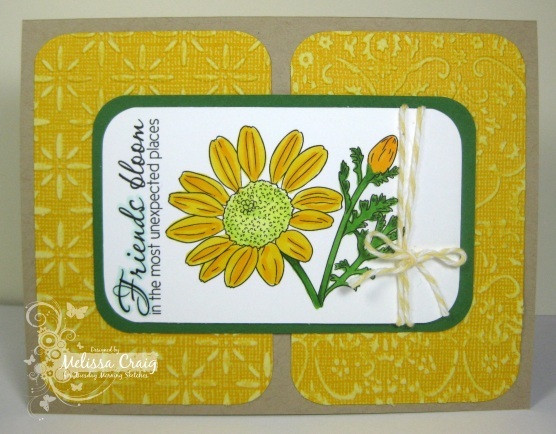 Now, when I started this card, I hadn't originally been thinking a distressed card. But there were a few mistakes made, which I turned into happy mistakes. And then I picked up the coolest paper at Michaels that was on sale and I had a coupon, so I think I paid $2 for it! Gotta love that. 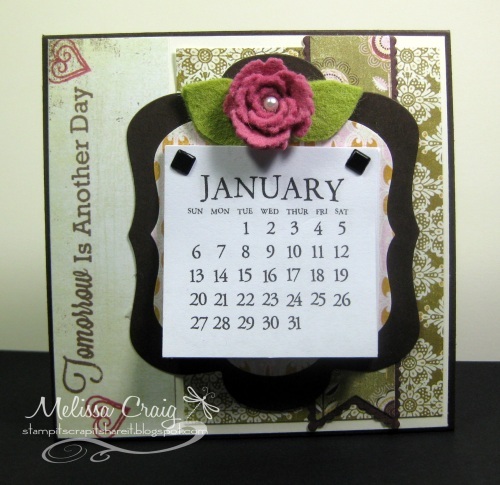 I am also submitting this into the There She Goes challenge for this week which is sponging with die cuts. I hope you have a great Thursday and we'll see you over at MTME. 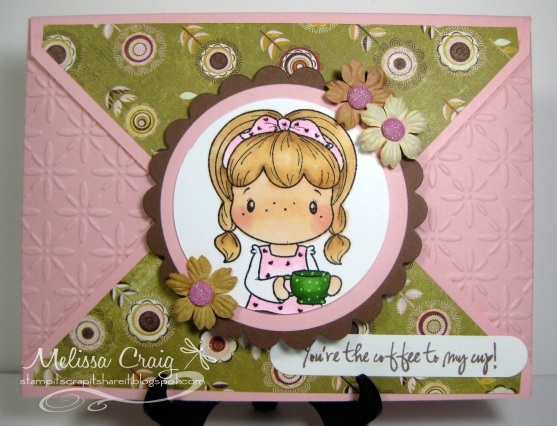 The image is from Floppy Latte Designs called Rena and her Chicks. Isn't this so sweet and so innocent? I love the soft colors. 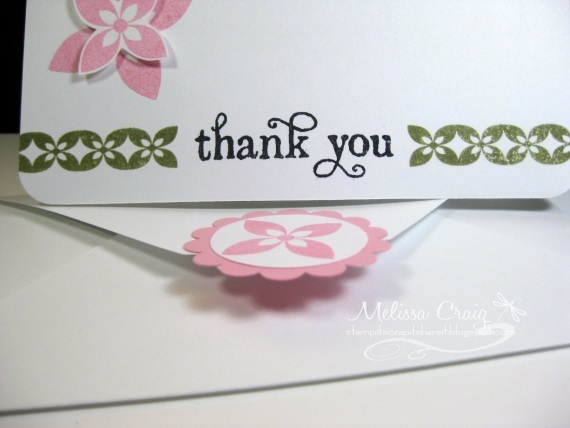 The sentiment I added to the card is from a stamp set by Sweet n Sassy called One of a Kind. I made the buttons with poster board and matching paper from the Linen matstack that I used. It's a simple sketch, just what we need to start the year off. See you over at TMS.